Ratti Entertainment gets a gold record for Blade. In a world where vampires walk the earth, Blade (Snipes) has a goal. His goal is to rid the world of all vampire evil. When Blade witnesses a vampire bite Dr. Karen Jenson (Wright), he fights away the beast and take Jenson back to his hideout. Here, alongside Abraham Whistler (Kristofferson), Blade attempts to help heal Jenson. The vampire Quinn (Logue) who was attacked by Blade, reports back to his master Deacon Frost (Dorff), who is planning a huge surprise for the human population. When Blade's mother was bitten by a vampire during pregnancy, she did not know that she gave her son a special gift while dying: All the good vampire attributes in combination with the best human skills. Blade grew up to be a vampire hunter for revenge on his mother's death. The vampires, who managed to infiltrate nearly every major organization, need Blade's very special blood to summon La Magra, the blood god, in order to reign over the human cattle, as they call us. Blade, along with his life-long friend Whistler battle vampires. 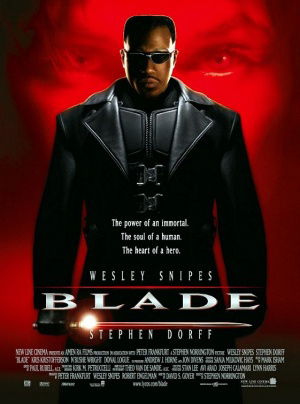 Blade was born of a mother bitten by a vampire, he possesses all their strengths and none of their weaknesses. He is known as the day walker because sunlight does not affect him. With the addition of a new ally, Dr. Karen Jenson, Blade endeavors to prevent the evil Frost from unleashing the blood god upon the world.